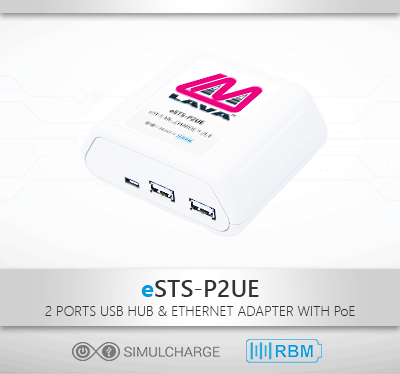 The eSTS-P2UE adapter is an extended version of STS-P2UE that features Power over Ethernet (Class 0) support, wired Ethernet connectivity, tablet operation as a USB Host while being charged (SimulCharge), the RBM technology for the battery modulation, improved network operations, and screen brightness management for the Samsung tablets. This adapter includes two USB 2.0 (Type-A) ports for connecting two additional USB peripherals. The eSTS-P2UE also has an option to use a USB power supply instead of using power from the network cable. RBM - the extension that makes them last. The eSTS-P2UE operates a tablet in SimulCharge mode. This technology allows the charging of the selected Samsung tablets while interacting with USB accessories. Standard USB OTG Adapters do not allow the tablet to be charged while operating with USB peripherals. The battery modulation allows the tablet to be repetitively charged up to an upper set point battery level and then allowed to discharge to a lower set point battery level. This mimics the standard charge cycles of charging a tablet and then disconnecting the charger before it will start a trickle charging (overcharging). The Network Recovery Operation enables tablet recovery from the failure attempts to connect to the network. It eliminates the issues with establishing a network address (TCP/IP address) for the tablet from a DHCP server. The RBM technology improves battery tablet longevity, and enhances a DHCP network operations. Power over Ethernet (PoE) allows network data and electrical power to be carried over an Ethernet cable, eliminating the need for an electrician to install a dedicated power drop. PoE allows the Samsung tablet and eSTS-P2UE to be placed up to 328 feet (100 meters) from its power source. The eSTS-P2UE provides superior tablet charging by converting the PoE signal locally to 5.2 volts for use by the tablet. This eliminates the issues associated with using the tablets original power charger. The eSTS-P2UE features a 10/100 Fast Ethernet interface that enhances the reliability and security of an internet connection. The Samsung tablet can use the dynamic address (DHCP) or static address for the network communication. The LAVA Tablet Manager lets you control the brightness of the tablet based on a time of the day. This reduces the tablet heat generation, power consumption, and optimizes the brightness for the commercial use. The STS-P2UE can be used on its own, or as part of a third-party enclosure solution, supporting a variety of kiosk-type applications. 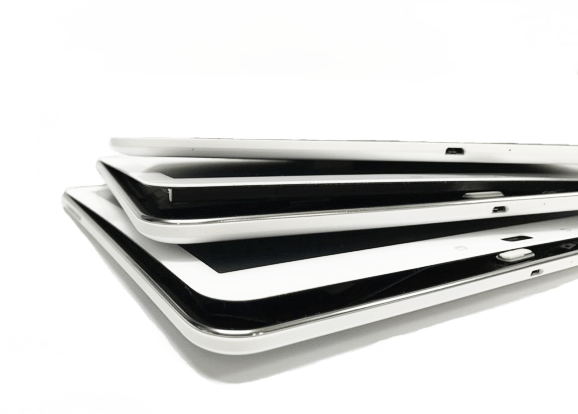 Enable Battery Modulation with LAVA eSTS products to protect your tablet kiosk from overcharging. Power Supply: Power is provided over the RJ45 LAN connector from a PoE enabled Network Switch on PoE Injection. The PoE interface provides up to 10.4 watts of power for the eSTS-P2UE and tablet charging. The Aux. 5V Input can optionally be used to power the eSTS-P2UE when no PoE is applied over the RJ45 LAN Connector. This power option is present for initial testing prior to enabling PoE. A standard USB Charger/Power Supply is used, such as that provided with the tablet. The power supply must not exceed 5.25 volts. Note: The custom 3.3ft/1m cable connects the device to the tablet. This cable may not be extended. Hundreds of hours of testing, and many months of design work, in-depth field trials, and close collaboration with Samsung has gone into developing LAVA SimulCharge solutions for Galaxy tablets. Designed for lifetime performance, each LAVA device is individually tested and covered by the LAVA’s industry-leading warranty.